Aphrodite is the Greek Goddess of beauty and love. As I was making the beads for this set those classical qualities kept coming to mind. 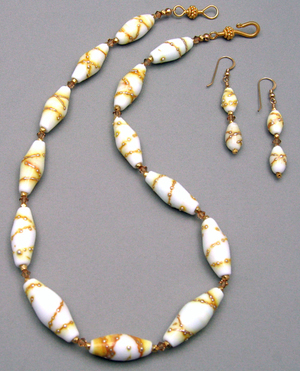 The beads are white glass wrapped with pure silver wire which produces the golden effect. The clasp and earrings are 14kt gold fill. Note: For more information see February 12, 2009 Blog entry.